Microsoft Gives Hotmail A Facelift, Says It Will Transition It To Outlook : The Two-Way If users are wedded to the @hotmail address, they will not be forced to shift. 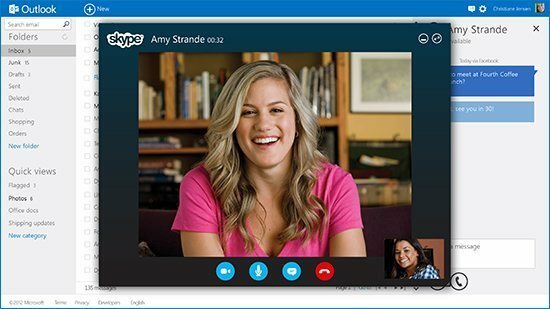 The new Outlook is incorporated with other services like Skype. Microsoft announced that Hotmail — the email service with 324 million users — will transition into a web and more social version of Microsoft's Outlook. Reuters reports that Microsoft made the announcement, as they showed off their free web version of the email program it is renowned for. "In a bid to recapture growth, Microsoft is renaming the service Outlook, a name familiar to most corporate workers who use Microsoft's Office email application, and sprucing up the whole experience. Hotmail users will be prompted to switch over to the new service over the next few months. "Hotmail, launched in 1996, was one of the first online email services, but it has not been updated by Microsoft for eight years." In a blog post, Microsoft said this was the right time to "reimagine email." They say the new Outlook is cleaner and it's all on the cloud, so no matter what device you are on, your email is available. Now, if people are wedded to their @hotmail address, they will not have to give it up. "There's no mystery behind the redesigns. Research firm comScore says Hotmail has 41 million monthly unique visitors; AOL, 24 million. That makes them the No. 3 and No. 4 e-mail providers in the U.S., behind Yahoo Mail, with 84 million unique visitors, and Gmail, 68 million. Worldwide, more than 324 million people still use Hotmail monthly, making it the top provider globally. But Hotmail's user base is on the decline. "The changes that AOL and Microsoft are implementing bring a more modern feel to their webmail. But I'm not persuaded that either provider will convince people tied to another e-mail service to shift loyalties. Overall, Microsoft's changes are more appealing."